Scot Gemmill is adamant he would never ask Oliver Burke to play through the pain barrier as he insisted Scotland’s under-21 squad has sufficient firepower without their absent captain. The powerful 20-year-old has struggled with injuries since making a £15 million switch to West Bromwich Albion in the summer, making just two senior appearances for the Baggies. He played the full 90 minutes for their under-21 side against Coventry in the Checkatrade Trophy on Tuesday night, finding the net in a 2-1 defeat as he mounts his latest recovery from a persistent hamstring complaint. put him in contention for tonight’s Euro 2019 qualifier against Latvia at McDiarmid Park and the fixture against Ukraine four days later. However, Gemmill believes Burke’s fitness is the priority as the most expensive Scottish footballer in history seeks to reach his potential. “West Brom made it clear they wanted him to continue his rehabilitation with them, very thoroughly and not take any risks,” said Gemmill, explaining Burke’s omission. 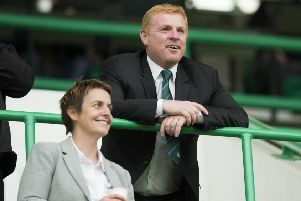 “There’s good communication between [SFA head of football science and medicine] Graeme Jones and their medical staff. It’s all about Oli and what is best for him. It’s not about us. They have a duty to protect him for their club. In Burke’s absence, the goalscoring burden is likely to fall upon promising Swansea striker Oli McBurnie, who found the net in the 2-0 win against Latvia in Vilnius last month. He has recently made strides towards establishing himself with The Swans, starting the recent Carabao Cup clash against Manchester United and turning out against Tottenham, Arsenal and Bournemouth in the English Premier League. He is supplemented in Gemmill’s squad by forward-thinking talents such as Ryan Hardie, Scott Wright and Lewis Morgan. “I know that at the end of last year there was a lot of people speaking about the lack of goals,” said Gemmill. “That was never a concern for me. The players have proved themselves at the younger age groups and also at their clubs. Scotland followed a magnificent 2-0 win over The Netherlands with a 3-1 defeat against England and a triumph away to Latvia last month, leaving Gemmill’s side in second spot in Group 4, a point ahead of the Dutch with a game in hand. With Andorra next up in March, the young Scots have a glorious opportunity to put themselves in a terrific position to reach Euro 2019 in Italy if they emerge victorious from this double-header.